STRV (Space Technology Research Vehicle) are experimental satellites procured for the UK Ministry of Defence by the Defence Research Agency (DRA) at Farnborough. 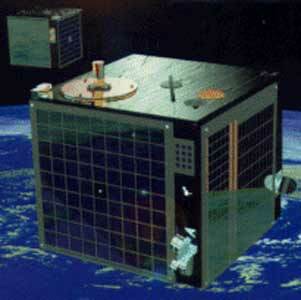 Launched on an Ariane-44LP H10+ on the 17th of June 1994, the two 52 kg micro-satellites built by the UK defence Research Agency (DRA) at Farnborough U.K., and are to evaluate new technologies in the harsh environment of a GTO orbit. The spacecraft are cubical in shape, with 450 mm sides. Experiments are carried from the Ballistic Missile Defence Organisation (BMDO), the European Space Agency (ESA), DRA, and various Universities. The mission life-time is expected to be one year. During their planned operational life, the STRV satellites were operated from the DRA Lasham groundstation in the UK, using a 12 m tracking dish. Later the satellite control was turned over to the University of Colorado. Follow on mission are planned. STRV-1c and 1d were launched on the Ariane-5G ASAP.